Simplicity and sweetness wrapped around your wrist. Customize with the grandkids' names or with the names of a family of three. Gift wrapping available in our signature lavender and rosebud packaging! We are in love once again. The simplicity of this bracelet speaks volumes. This bracelet makes the perfect gift for Grandma. Stamp up to three names or words on this bangle and create a piece that will warm your heart. The bangle will be stamped three times. You can choose between two options - the same name three times or three different names. Each name/word can be up to 12 characters/spaces. For the mother or grandmother of one you can have the child's name stamped three times around the bangle. For two children stamp LOVE or FAMILY in the middle with the two kids' names on each side. 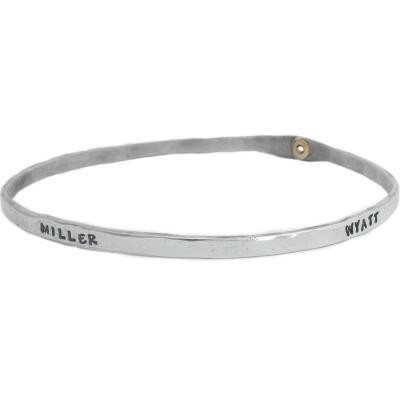 Or have three different names stamped around the bangle. Choose what is most meaningful to you. Bangles are approx 3mm wide. All silver is sterling and rivets are brass. This is a bangle bracelet and does not have a clasp, it slides over your hand and onto your wrist. My brother and I gifted our mom a grandmother's bracelet with the 3 grandchildren's names engraved on it. She loves it!